Handle Length Choose an option30"36"48"48" - 68"
Hoop Size Choose an option17" x 19"22" x 27"27" x 32"32" x 36"
Top End Quality at an Affordable Price! 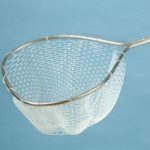 You now have the ability to build a high quality fishing net, customized to your EXACT specifications and needs. There are hundreds of combinations available, you simply have to tell us what you want. It’s as easy as making four easy choices: 1.) Pick from 4 different handle sizes. 2.) Choose from two yoke sizes. 3.) Next, select from four different hoop sizes to fit your specific needs. 4.) Pick from 4 net bag choices. 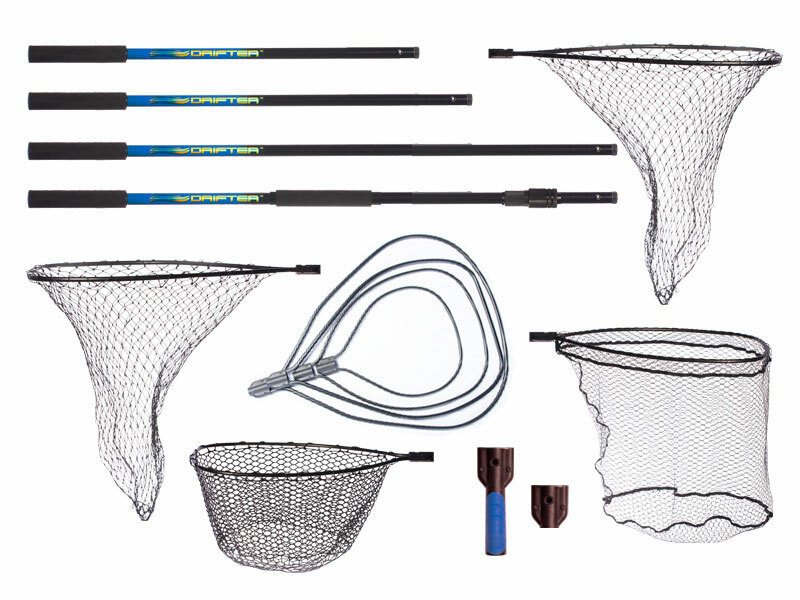 You can mix and match the options and play with the combinations until you find the PERFECT net that meets your needs and price. The Fiberlite handles feature the lightest weight, durable material you will find available. Available in four sizes, you can choose from 30″, 36″, 48″ fixed length handles and a extendable 48″-68″ extendable version. These handles feature black, UV resistant foam grips that are contoured to fit comfortably in your hand. Each handle comes standard with a high resolution holographic logo that brings a look worthy to be in your boat. 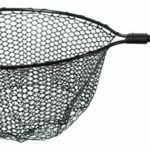 Fiberlite handles feature oversized, stainless steel buttons which allow for ease and comfort when extending and collapsing you net. The extendable handle allows for quick extensions and a sure lock each time. The locking cam is designed of a high impact inner portion, and an outer-aluminum housing for strength and durability. The extendable handle also includes a second foam grip for extra control. The Fiberlite series features two yokes. Each are made of fiberglass reinforced, high impact plastic that which are lightweight and extremely strong. 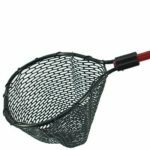 The small yoke provides strength without adding weight and bulk to the net. The large yoke adds an additional hand hold point for lifting large, trophy class fish. It is contoured to fit ergonomically into your hand, and provides a rubber surface that is contoured with grooves for slip resistant, unparalleled control. The Fiberlite series features 4 hoop sizes. Each is black to avoid spooking the fish at the boat. The three smaller sizes are made of 1/2″ aluminum, and the largest hoop features a 5/8″ hoop reinforced with solid 1/2″ aluminum rod on the inside. 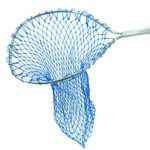 Finally, completing your own custom designed net, you have 4 net bag options to select from. Your choices include standard poly, rubber coated poly, lightweight rubber and PVC coated mesh. 30", 36", 48", 48" – 68"
17" x 19", 22" x 27", 27" x 32", 32" x 36"